It started with an unassuming bunny that hopped along a number line. In 2011, our team at KCP Technologies released Sketchpad Explorer for the iPad, making it possible for teachers and students to interact with desktop Sketchpad models on their iPads. We were thrilled to bring the iPad’s multitouch technology to Sketchpad, but sensed that there was more to be done. Could we leverage Sketchpad Explorer to design an iPad game that would include eye-catching graphics, appealing animations, and solid pedagogical and mathematical content? That’s when our attention turned to an old Sketchpad activity featuring the hopping bunny above. The focus of the activity was multiples and factors: How many different ways can the bunny reach 10 by taking equal-sized hops? We knew that a bouncing bunny would appeal to children, but was this mathematical theme enough to sustain an entire multi-level game? Probably not. Keeping the bunny as our protagonist, we rethought the mathematical content, targeting multiplication instead. 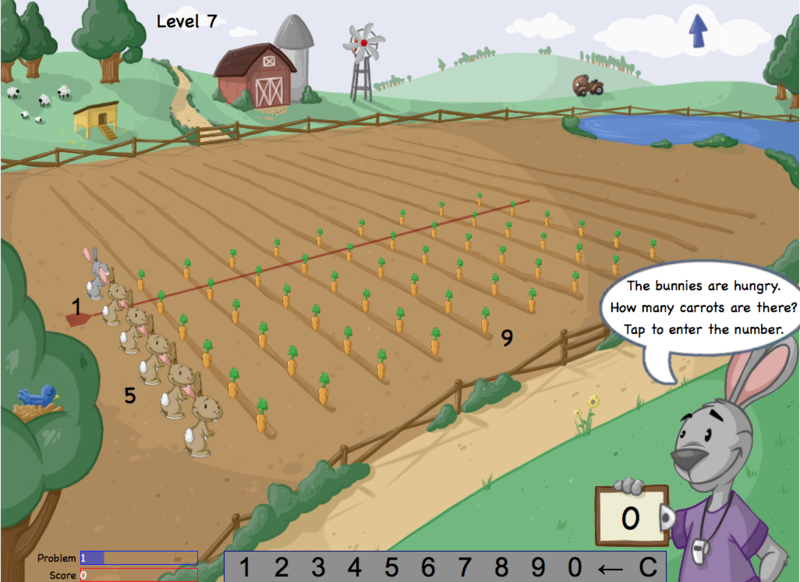 And rather than confine the bunny to a number line, we imagined either the single bunny or a team of bunnies hopping through a field of carrots. Ultimately, we picked bunny c.
Of course every game needs a good, catchy name, so we debated what our game should be called. Candidates included Multiplying Bunnies, Math Bunnies, and Hop, Eat, Multiply. Finally, we settled on Bunny Times, both for its connection to multiplication and because we imagined the game including newspaper headlines heralding the mathematical achievements of the bunnies. My colleague Scott Steketee set to work building the game using desktop Sketchpad. We rethought the game’s structure dozens of times, testing it with students and scrapping ideas that did not work well. Scott, who is an expert sketch builder, outdid himself in terms of the Sketchpad techniques he employed to construct the game. No exaggeration, Bunny Times is the most intricate sketch ever built. Even our most knowledgeable Sketchpad experts can’t quite believe that the game was built entirely with the functionality found in desktop Sketchpad. You can play Bunny Times directly in your web browser here—there is no need to download or install any software. So get hopping and try Bunny Times! A carrot for your thoughts if you have feedback you’d like to share with us.